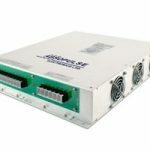 The CSI 500-2XD3-IP66 series was developed for the transportation, mining, marine, military, telecom and oil and gas applications that require a robust, waterproof, dust-proof and sand-proof pure sine wave AC-output solution. 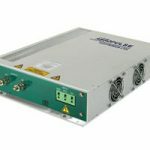 The CSI 500-2XD3-IP66 high frequency PWM inverters deliver 500VA with pure sine wave output voltage. They provide 115Vac continuous at 60Hz or 400Hz, or 230Vac continuous at 50Hz. The inverters accept voltages of 24Vdc (21-29V range), 48Vdc (42-56V), 110Vdc (90-130V), 125Vdc (106-145V) or custom. Efficiency is typically 80% at full load. Filtering on the input and output contributes to low output ripple and noise; high frequency ripple is less than 500mVrms. Electronic protection includes 2250Vdc input-output isolation, inrush current limiting and reverse polarity protection. The units comply with EN60950-1 and corresponding UL 458 and CSA international safety standards. 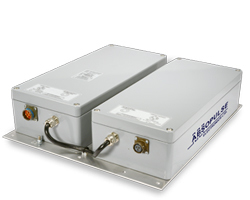 The CSI 500-2XD3-IP66 inverters are packaged in two IP66 rated diecast aluminum enclosures with sealed circular connectors, mounted on a base plate. The internal inverter modules are fully ruggedized and the boards are conformal coated for immunity to high levels of shock, vibration and humidity. Cooling by internal conduction to the walls of the IP66 enclosure and by surface convection enables operation within a -25°C to +55°C temperature range for full specification. Installing the unit on a heat-sinking surface extends its full power range. We employ application-specific vents that allow air to flow in and out of the enclosure while blocking the entry of moisture and contaminants. This ensures that pressure differentials do not develop in our sealed enclosures. When pressure inside the enclosure is equalized, strain on connectors is minimized, which contributes to the impermeability of the environmental seal and protects the internal boards from moisture, particulates, oil, salt, sand etc. This in turn contributes to the long term reliability of the units. 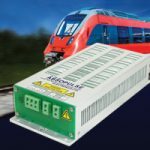 It is important that you provide us with as much information as possible about the environment in which our power conversion solutions will operate, i.e. if they will be exposed to wide daily ambient temperature fluctuations, to frequent thunderstorms, to high winds, if they will be transported onboard aircraft etc. This will allow us to customize our solutions to meet the demands of your application. Please contact us and we will be pleased to discuss your requirements with you. D3 enclsoure: 406 x 320 x 94 mm (16 x 13.44 x 3.7″) – L x W x H.